This is the central part of the constellation Cygnus, including Deneb and Sadr as main stars, covering a field of about 13 by 10 degrees. This image focusses on the rich H-alpha nebulosity in this region. In contains some of the famous emission nebulae, e.g. the North America Nebula, the Pelican Nebula, and the Crescent Nebula. However, what I find even more exciting is the sheer mass of nebulosity that covers the whole fields with dramatic ripples and dark lanes. This is the first light for my new “enforced H-alpha” filter from Baader with a width of 3.5nm, works extremely well with the Samyang 135mm lens and the ATIK 460ex camera – no halos and very clean subs. 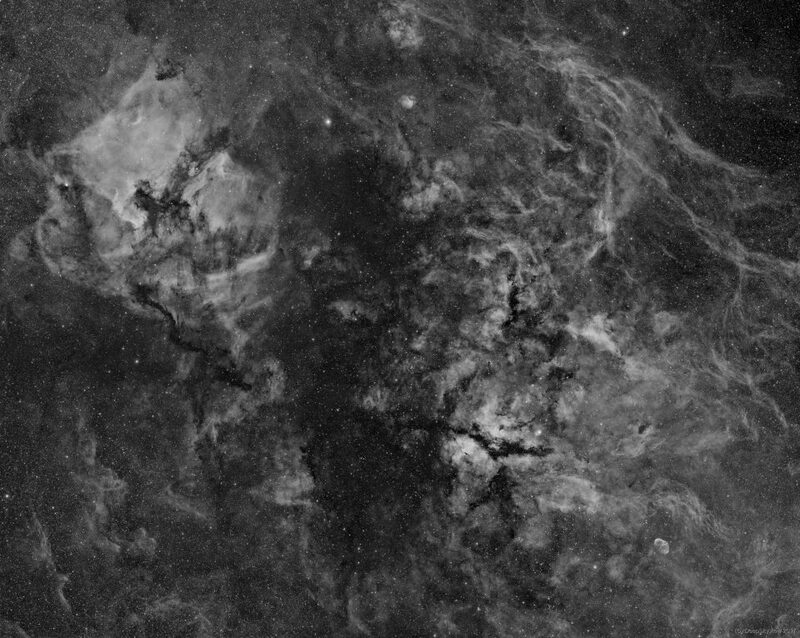 At the same time it is my first attempt at an larger wide-field mosaic. This image is a 3 x 3 mosaic composed in Pixinsight using the MosaicByCoordinantes and GradientMergeMosaic tools. I was a bit worried about combining this mosaic, but it turned out to be really straight-forward. Apart from this I only used MureDenoise, LocalHistogramEqualization and simple HistogramTransformations – no masks or star magic involved.